It is estimated that there are less than 50,000 hawksbill turtles remaining worldwide. The global population has declined 80% over the last century and the IUCN Red List classifies the species as critically endangered. 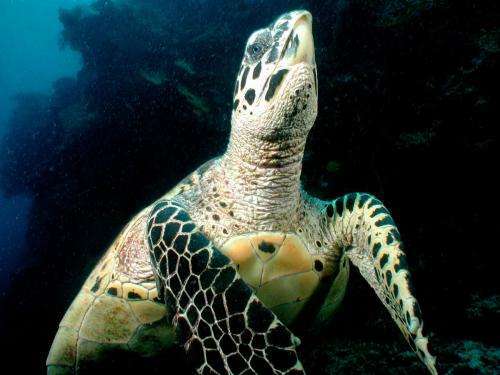 "The confirmation of a hawksbill turtle in Pakistan is a new addition to the diversified marine fauna of the country," said Rab Nawaz, director of WWF-Pakistan. "This finding is good news for the species." The rescue demonstrates the positive impact that the training of ship's crews can have on the protection of marine diversity. WWF has run a program to train marine monitors in Pakistan since 2012. The crew carefully removed the hawksbill from the net, photographed the individual and successfully released it back to sea unharmed. "After 18 years of working these waters, finding the hawksbill was the most exciting catch I've ever made," said boat captain Shah Zamin, "I am glad that we had the awareness raising from WWF to record the find and save the turtle." The turtle measured 47 cm and is estimated to be a juvenile. Adult hawksbills can reach one meter in length and weight up to 80kg. The species is easily distinguished from other sea turtles by its sharp, curved beak and the saw-like appearance of its shell.